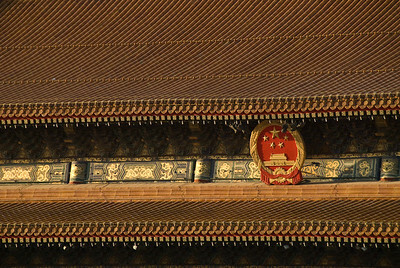 For reasons we will probably never know, the Chinese have an inexpicable penchant for hanging out in their hotel rooms with their doors open, thereby allowing their cigarette smoke, the din of their pandemonious and cacaphonous card-playing hubbub, and the nauseating stink of their all-powerful baijiu (hard Chinese liquor) to waft out into the hallway and the world at large, thus amplifying for any of the hotel’s resident foriegners the anthropological insights into the life, times and folkways of the country and people that the foriegners surely came to experience in the first place. Right? 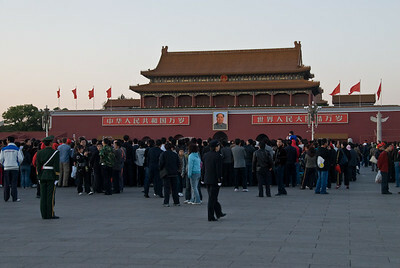 Tiananmen Square kinda creeps me out. Not specifically because of what happened there eighteen years ago, though that does play a role. No, the square creeps me out more because of the massive security presence and the sense you have that you’re constantly being watched. Well, you are being watched. From the moment you step out of your cab or emerge from the Beijing subway steps, you are being sized-up and then guided in the proper direction by various uniformed police, security, and army personnel. Not that they’re impolite, but they ain’t smiling, either. And this is just to get you across the street. Once you alight on the square itself, there are cameras everywhere, of course, as well as public-address loudspeakers and all manner of police and security vehicles. 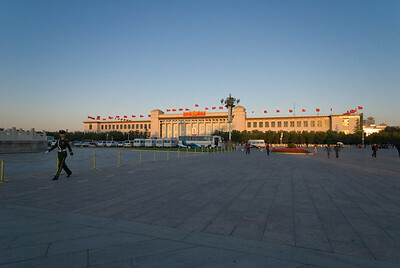 Some security personnel are stationed strategically around the square at various points of interest, while others march around Tiananmen in roving platoons of two or three or four. 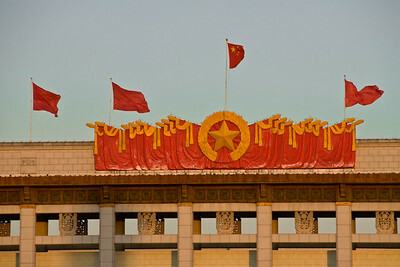 Granted, the Chinese People’s Congress was in session this October (in the massive, Soviet-style building that abuts the west side of Tiananmen Square), so there was an expected uptick in number of security forces present. But there really weren’t that many more than in previous years that I’ve visited and that ‘Big Brother is Watching’ feeling was the same as always. It’s fairly common knowledge that there are also numerous plainclothes security officers in the square at all times, and on this recent visit I believe I encountered one. Customarily, Beijing residents who have studied English to any significant degree, recognizing a foreigner, will attempt to strike up a conversation, both to practice their English and to fraternize with said foreigner. 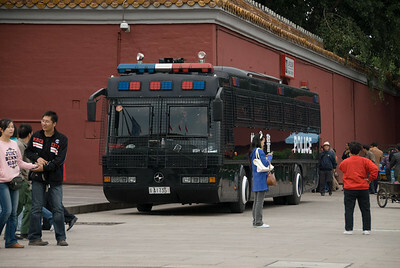 This is especially true in Tiananmen Square. But the “independent filmmaker” in his early twenties who, upon noticing me taking photographs around the square looking for all the world like a journalist with my vest and all my gear, approached me and began lamenting the current state of politics in China - well, this guy couldn’t have been more transparent. 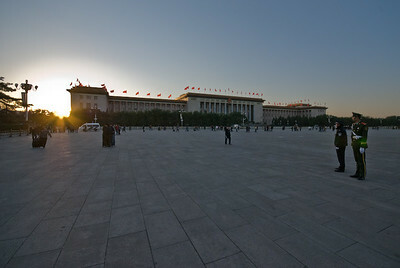 Under the pretext of being a naive local youngster wanting to commiserate with a Westerner, he asked me a laundry-list of questions relating to my opinions on various hot-button political topics in China - a big no-no anywhere in China, never mind in the middle of Tiananmen Square. By the time he told me how popular George W. Bush is among his Chinese comrades, I was pretty well and good convinced that I was being baited by an undercover government agent. I played it cool by denying any interest in politics, Chinese or otherwise, explaining that I am just an amateur photographer wanting to photograph his country so as to share the beauty of it with my American comrades. Evidently, he didn’t believe me. He asked for my contact info. I gave him my e-mail address, which he dutifully wrote down on a little reporter’s notepad that he just happened to have in his pocket. The e-mail address I gave him was fake. After telling me he’d “be in touch” (I should watch for an e-mail from “Tao”) he began to walk away. I shouted to him that he should be more careful about discussing politics with foreigners, or anyone else for that matter, in Tiananmen Square. I wouldn’t want any harm to come to him, I said. I wasn’t necessarily kidding. He chuckled and walked away. I resumed my photography. 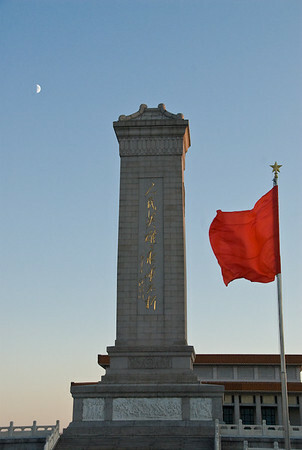 It was time for the sunset flag-lowering ceremony at the north end of the square, across the street from Chairman Mao’s giant portrait. 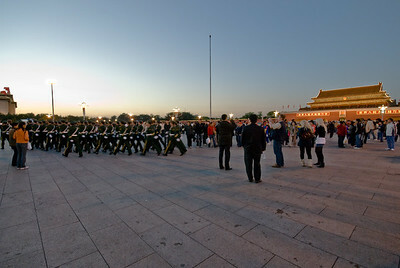 There’s more photos of Tiananmen Square in this gallery. Who says there's an oil shortage? 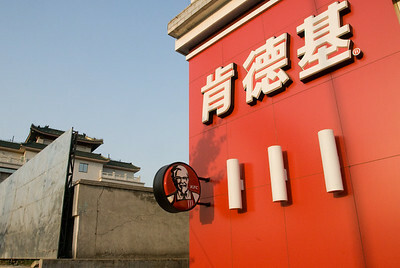 Just spend a few weeks eating the local cuisine in China. Seriously. 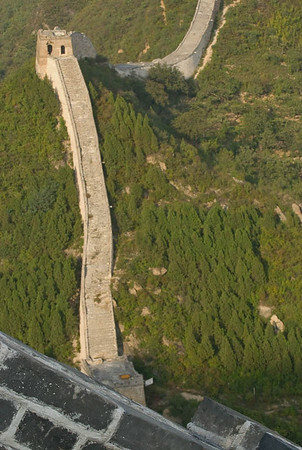 If you really want to get to know the Great Wall of China intimately, you have to go to where the tourists aren’t. 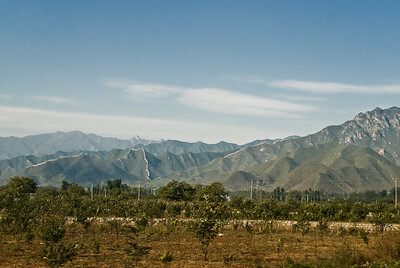 The Huanghua section of the wall, in the mountains north of Beijing, is apparently just that place. 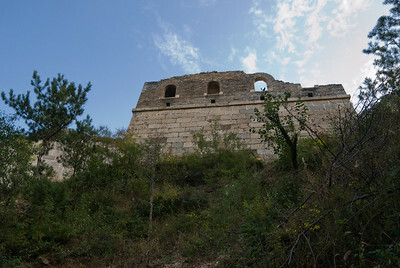 Huanghua is an unrestored, but very well preserved, length of wall that rambles steeply and precipitously up and over craggy mountaintops and, for one afternoon, we literally had miles of it all to ourselves. One arriv es at this part of the wall without any fanfare: after driving up into the mountains past the usual farms and villages (where older male villagers continue to wear the old green or blue Mao uniforms and everyone still gazes suspiciously at foreigners), you abruptly stop at the side of the road where a handful of middle-aged women from a nearb y village are waiting for someone (anyone) to show up so they can sell you an “I climbed the Great Wall” t-shirt and collect a couple of kuai (Chinese money) as “tribute” (it’s their wall, after all). You the clamber several hundred feet up a wooded hillside and finally arrive at the base of a watchtower. Climb up a makeshift bamboo ladder and you’re on the wall. 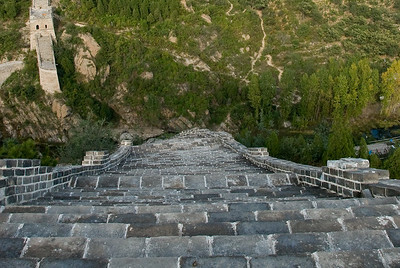 After admiring the spectacular view from the watchtower, it’s time to begin climbing further up the wall upon crumbling stone steps and even more perilous lengths of wall that are altogether without steps and insanely steep. 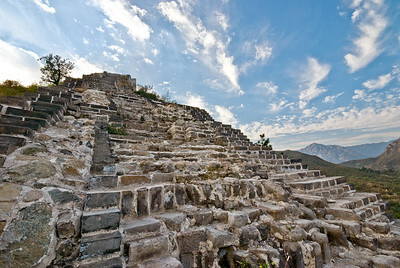 There are no handrails of any kind and if you slip and fall, you’re going to tumble down hundreds of feet of hard stone masonry. (That next watchtower is only a half-mile or so away. You can do it!) The idea of armies of weapons-laden Ming dynasty warriors scurrying up the wall is incomprehensible. If one soldier were to lose it, they would all tumble off the wall like dominoes. Maybe they did! 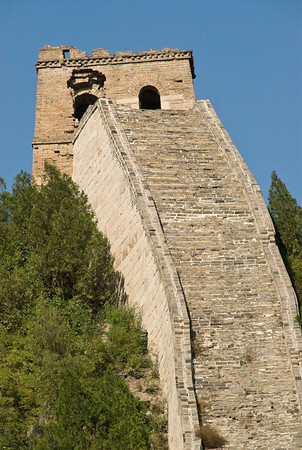 In spite of the dire consequences of falling off the wall (on my birthday, no less), we managed to conquer a fairly significant length of it and attain the dizzying heights that the Cinese armies did hundreds of years earlier in their mission to fend off invading Mongol hoards and Manchu warriors. It was well worth it! 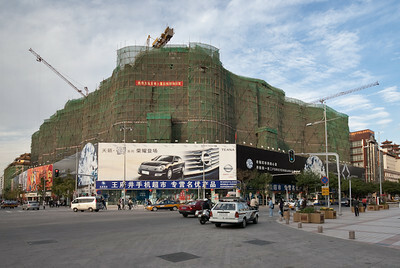 The the entire Great Wall at Huanghua gallery here. I don’t recall the air-quality ever being worse than it is right now in China. Not just in the interior provinces, where the air is largely expected to be awful, but in Beijing, which seemed to be improving dramatically over the past several years. 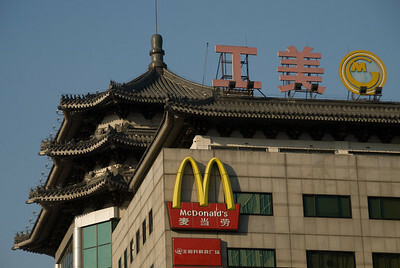 The Chinese have been on a mission to clean up Beijing in time for the 2008 Olympic games, and that purportedly included the environment in addition to the wholesale renovation and refurbishment of the physical city. 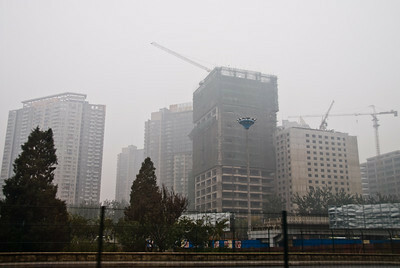 Maybe the Chinese figured out that by regressing in the air pollution department, their Olympic athletes would be at a distinct advantage next year in the sense that no foreign athletes that haven’t been training in these conditions could possibly compete in any Olympic events that require even a modicum of physical exertion and endurance. 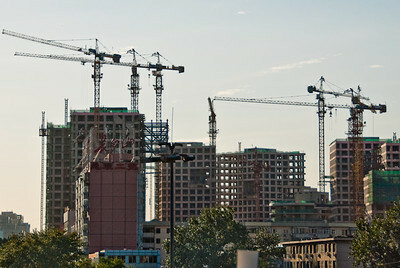 I thought that all of the renovations of Beijing’s infrastructure would be mostly complete by now, but it seems the Chinese are still going full-throttle, as many new demolition and construction projects are just now getting underway. 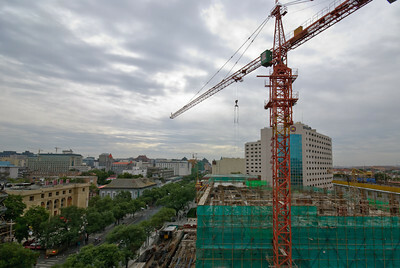 One would question their ability to be done with everything by next summer, but then one realizes that construction sites in China are 24-hour-a-day, seven-day-a-week affairs (peace & quiet is way down at the bottom of the list of Chinese institutions). Trust me, they will finish. But, in the meantime, the hundreds of construction projects in progress around town are spewing some seriously noxious pollutants into Beijing’s already challenged air. I don’t know what brand of solvents and adhesives the Chinese are using in their new buildings, but you can smell them a mile away. Anything that you can smell from a mile away generally can’t be good for you, right? All the pedestrians and cyclists who cough up their lungs as they pass the construction sites pretty much answer that question. I’ve never seen locals wheezing and hacking like that before. Combine the construction chemicals with all the other particulate matter cast into the air from all the gravel, concrete, steel, brick and soil being stirred up by towering cranes and heavy machinery and you’ve got a hell of a recipe for un-breathable air. All in the name of progress. 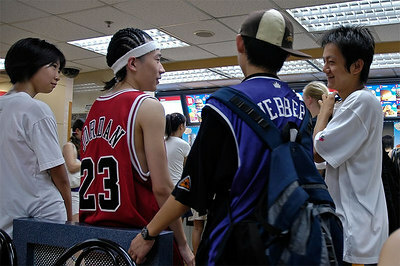 More pics like these in my China 2007: Urban Beijing gallery. One of the things that I particularly enjoy about photographing China is that it’s a far more colorful country than most people give it credit for. I think that most people, if they have any sense of what China looks like at all, tend to imagine dull, washed-out reds, golds & greys and muted greens & browns. While not entirely inaccurate, modern China certainly has a far more expansive color gamut. Viewers of my photos are often surprised at the abundance of saturated primary colors that are more remeniscent of Central America than of China. Bright, eye-popping color is especially evident in the interior, rural towns and cities of China, and is exemplified by the all-too-prevalent storefront signage and advertising that seems to line every city street, country road, and back alley. Even many rural villages now are now painted in predominantly bright primary colors. I’ve even had people ask me if I intentionally increase color saturation during post-processing of my photos, but a close inspection of the images reveals that these intense reds, blues, yellows, and greens simply appear all-the-more saturated when juxtaposed against the often grey skies and polluted air in the Chinese interior. 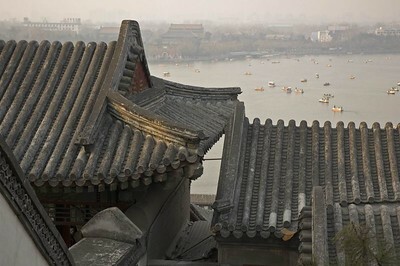 From a photographic perspective, the often stark contrast between highly luminant and more subdued color in the same scene serve to underscore one of the overarching themes that I try to capture with my camera in China: the dichotomies and contradictions that seem to underly virtually every aspect of life in this country.